Most of us are visual, you know the old saying… “A picture can tell a thousand words“. I am here to tell you that when it comes to business decisions, decision makers will move mountains if they can see their progress on charts and maps. Today, I’m exposing a really cool and free online map builder: http://www.batchgeo.com. I have been using BatchGeo to produce monthly sales and marketing reports for almost 2 years, I thought a few of you could use this site and get real creative to help demonstrate why you should get that raise! BatchGeo takes any address and plots it on a google or yahoo map for you. “Yawn” you say? But, what if you can plot all your internet sales from the last 90 days, assign different colored push pins for each lead source… in say 60 seconds!!? Now we’re talkin’! Let’s start ‘er up and take her for a spin! First project for our demo will be plotting a list of a few of our DR members on a google map. 1st, we collected the names on our DR message boards, then, I moved it to a Spread Sheet, then I copied and pasted that info into BatchGeo and viola! Look what we have here! The Dealer Refresh Community Foot Print! Nice indeed! What BatchGeo.com will do is allow you to copy-n-paste any address information from a spread sheet and automatically plot it on a Google or yahoo map. The information that comes from this can really move decision making. How big is your sales foot print? What about last year? How big is your service foot print? What if you want to advertize in a market that’s just outside your reach? Say your 90 mins out from a large market and you want to run a Google AdWords campaign to draw people in. After you plot your existing sales on BatchGeocode.com, Execute your new Google AdWords campaign, the following month, re-run your updated info into BatchGeo.com and your new map will see if your footprint has changed. You can plot “Internet Sales” vs Non-Internet Sales. You can plot sales by lead source, you can copy n paste in your incoming phone call records (by lead source if you’d like ;-). We opened a new store after an Sales Map analysis quickly showed everyone that this new store’s location would have no material impact on the other stores footprint. Nice… very nice. Did I mention it was free? If you like it, They take donations via PayPal! Awesome Stuff! You're always a few steps ahead of your competition. Todd is lucky to have you. Nice find Joe. I used to have a large map with colored pushpins – I achieved the same results but this is WAY EASIER. I have several ideas in mind already. Here is a real world example of how BatchGeo can move a business forward. We had an under performing store that I had pegged to poor phone skills. I listen to the incoming calls and that store needed help…. badly. Like every other store, managers are upto their armpits fighting alligators and we handled phone training like most everyone else, "WTF IS WRONG WITH ERNIE? TELL HIM TO GET BETTER OR…" You know the routine. Because we can listening to calls OFTEN causes a manager to react to THAT single call and not see it all in a larger light. I batchGeo'd the stores sales and I had an "Ah ha!!" moment. 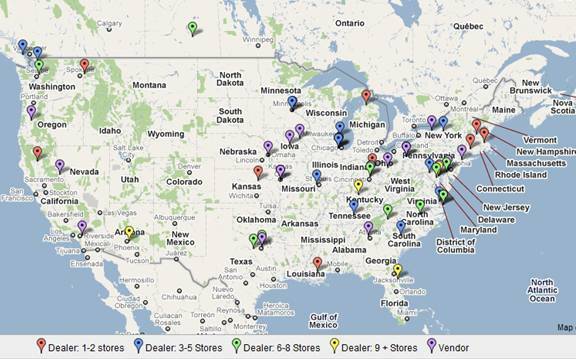 I found the store was doing well in its local market, but had very poor results everywhere outside a 10-15 mile radius. Viola! Thanks to BatchGeo and the Ninja guy 😉 I had it all in a nice tight package. Cause: BatchGeo reveals poor long distance sales that RELY on phone skills. Because of BatchGeo, everyone could see the cause and effect. I had the buy in from the top and the managers. That's how ya dooze it. Joe, this is sensational. We recently purchased Microsoft Map Point for exactly this. It was purchased after our VP bought our GM's and the marketing department Ego Kills books. Have any of you read this book? It talks about the why to have a mapping process and some solid plans of attack for the data. It's prohibitively priced but from following your comments Joe, I think you would absolutely love it. Glad you like the site Mitch, hope it works out. I'll ck out the book. When it comes to advertising, my mind sees so many angles, so many shades of gray that my ego is rarely in play. Advertising is a chess game, a game of war, a game of strategy, and when my competitor is running on Ego… I know I got him right where I want him. If the book was about working with a HIPPO… now that's a different game altogether! Teach me how to speak to a HIPPO and I'll buy that book right now! "Dare I mention your ego? Well I'm not just mentioning it, I'm calling you out. The fact is, ego is the single biggest reason dealers are not as successful with their marketing and advertising as they strive to be…. I will not debate this, if you disagree you're wrong." "…The fact is, ego is the single biggest reason dealers are not as successful with their marketing and advertising…"
#1). Can dealers keep making mistakes and still eek out a living?? #2). howinthehell we dealers (as a whole) are so… Stuck in a time warp? I say the real culprit is a sneaky disease called LUFUCBSA. How "Darwinian" does a Dealer need to be if the phone is always ringing? It's a great setup for "Stinkin' Thinkin'". we have got great tool for dealers , they can upload their listing in few seconds and get on the way to get enquiries quick.